The impact of home field/court/ice advantage on officiating. Interesting, but keep in mind that teams may perform relatively poorly because of being on the road, and that in turn translates into additional penalties. To the credit of the article, it mentions that possibility. And how do NFL officiating crews compare when it comes to the number and types of penalties called. I'm sure there are real differences between crews, but remember that much of the differences are likely due to sample error and the actual incidence of penalties committed. Twenty tips for interpreting scientific claims. 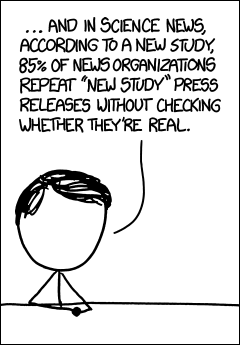 And from xkcd. How true? Very cool visualization of NCAA conference realignment since 1965 from the NY Times graphics editor and 4th Down Bot creator Kevin Quealy. From the well-titled website Quirky Research, a list of every OT game in which the team that won the coin toss chose to kick off and its result. Just keep in mind most of these are from another era. Still, this season teams that did that are undefeated! NFL team stats and graphs. How can you not like that? This is a bit dated already, but I wanted to highlight Jason's excellent analysis on McCarthy's 4th down decision in OT a couple weeks back. Bonus, here's Jason on Mike Smith's late game FG when down 4. #4 As far as I can tell this is a myth. There is more studies (I found four, including the NIOSH over the last two decades) on NFL life expectancy. All of them came to the same result: Players live longer than the average american. The real problem they get after playing is depressions and permanent pain (roughly 2/3 of players) who interact together... I wonder where the myth of "shorter lives" comes from, and more importantly that it is still upheld. May in the future players life expectancy will dip below the average american b/c of the hi-dech dope that is going on nowadays (it´s a big experiment with the players being the guinea pigs). I guess that (& the permanent pain) will be a bigger issue than the "popular" concussion topic. Regarding #4 (weight versus things like CTE causing different lifespans): another issue is that weight and likelihood of CTE are probably correlated. In general, if you're little, you're probably playing a position like kick returner, speed receiver, free safety, kicker, etc., and while these guys take (or deliver) some big hits, they tend to do so once or twice a game. If you're big, you're probably playing lineman or linebacker or fullback, and you're knocking your head around every snap in every game and every full contact practice. So it might be position played, not simply weight, that is a predictor of lifespan. It should be possible to test statistically, since there is a sample of small players (smaller RB's and slot receivers) that take a lot of hits but are still not high in weight. Question on the "players live longer than the average American" statement: is that based on all professional football players, or is there a threshold on how long they played? If CTE requires a lot of repetition, then I would expect someone who had a short career (say, 3-4 years, which is a huge number of professional players) to not suffer from adverse effects of CTE, but because to even play in the NFL they need to be in superb physical health, they probably will live longer than average Americans (absent CTE/related issues). I haven't read the studies cited, but my first reaction is that a simple comparison would be very biased. NFL players have already lived a healthy 21+ yrs at least. We'd have to compare them to American life spans of people who also get a 21-yr head start on a healthy life. IOW kids that die young drive down overall life expectancy. That´s on all NFL players. But I guess there wouldn´t be a difference between those playing 4 years and those playing 14, because also the "permanent pain" is roughly the same 2/3 for "short term" players as for "long term" players. For example 15-yr-vet Kevin Greene said he never had a knee issue in all those years, while others get destroyed in their first year (like RG3). Another 15-yr-vet, Babe Parilli said he has never had any pain issues after ending his career. It seems it comes down to luck. For every Al Toon and Curt Marsh is one guy going out of the NFL unscathed. Great point with the 21-yr-headstart. I have to re-read the studies with that in mind. I think the difference shouldn´t be that big either. I don´t know how many people die before age 21 in the USA, but I wildly guess no more than 2%. So w/o those humans, I guess the life expectancy of average americans would go up by max 1/2 years. After all that would mean players and non-players have roughly the same life expectancy, but the myth "players die in their 50s" is plain wrong. We´ll see how and if that changes with the human hi-tech dope experiment that´s going on nowadyas. The "11 minutes of action" article is interesting but rubs my intuition the wrong way. There are core parts of football gameplay that, while not "action" are still worth watching. The few seconds before the snap, where the players line up and the offense sets-- that's part of the game. There are all manner of penalties that might be called if players make mistakes (offsides, encroachment, false start, too many men on field, etc.) to say nothing of audibles and play-abortive timeouts. It's true that the football clock captures a lot of downtime that isn't really related to gameplay, "peeling themselves of the turf and limping back to the huddle", but 11 minutes is a little sensational. I watch compressed games on GameRewind, where most everything from spot to snap is cut. There are occasional brief instant replays for touchdowns or really big plays. Game lengths in that format are typically around 30 minutes, and they "feel" really fast. I often have to pause the games myself to either rewind and watch plays I missed because I got distracted or pause because I had to step out of the room. Gamerewind also has full-length broadcasts without commercials.